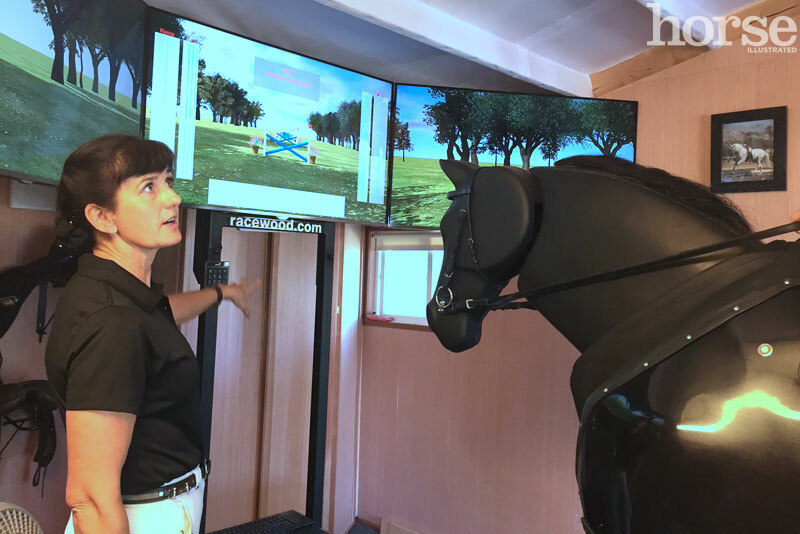 The Maximus Event Simulator is a new generation of fully programmable interactive horse simulators, and the world’s first simulator that can perform Cross Country, Show Jumping and Dressage from Beginner Novice to Grand Prix. The Simulator has realistic movements in all gaits. The body, neck and head move independently and the different jumping actions are as close as you can get to the real thing! With 3 large monitors, the Event Simulator gives the rider the ultimate riding experience. In jumping mode, the reins are used to control the movement of the horse by steering around the course. Pressure on the reins controls the cantering pace of the horse when approaching the jump, and can also slow down or halt the horse at any time. The interactive screen displays ongoing feedback to the rider. When in Dressage Mode, the Simulator becomes a different horse! The neck rises higher, all gaits can be collected, medium or extended. The neck reacts for the rider’s seat and rein contact. Stretching down and away if too lose, or stop if too strong. Rider can practice posture and leg/hand control while sensors show crookedness, uneven reins and/or leg pressure. Or - ride in a full dressage arena, practice your test or the movements you want to perfect! The Instructor stands next to you at all time, ready to put hands-on to show you how to do it correctly. This Simulator can perform lifelike piaff/passage as well as one time changes!